These FULLY ONLINE courses are the two-term sequence of developmental algebra intended to improve your critical thinking abilities and prepare you for college level mathematics courses. Elementary Algebra covers algebraic expressions, linear equations, linear inequalities, an introduction to graphs and functions, lines, systems of linear equations, integer exponents, and polynomials. Intermediate Algebra covers algebraic processes related to polynomial, rational, radical, quadratic, composite, inverse, exponential, and logarithmic functions. The math 090-095 sequence is designed for the student who is prepared to take algebra at an accelerated pace. This sequence can instead be taken in a normal-paced three-term sequence by taking math 089-091-093 (Algebra I-II-III). The 089-091-093 sequence covers the same material overall, but fewer topics/chapters per term than the accelerated 090-095 sequence. By opting to take the accelerated sequence you should be prepared for the added workload and fast-paced delivery. See Clark Mathematics Division's Should I take the math 089-091-093 or the math 090-095 sequence? flyer for more information. Prerequisite to Math 090: Pre-Algebra (Clark's math 030) passed with a grade of at least "C" or qualifying score on the placement test. Prerequisite to Math 095: Elementary Algebra or Algebra II (Clark's math 090 or 091) passed with a grade of at least "C" or qualifying score on the placement test. Model and answer questions pertaining to real world situations, using linear equations. Demonstrate the transition from arithmetic expressions to algebraic expressions. Solve an equation for a specified variable using additive and multiplicative inverse operations. Connect a linear graph to its equation and to its representations in functional and verbal form. Find a useful equivalent form of complex algebraic expressions. Solve a quadratic, logarithmic, or exponential equation. Choose an appropriate strategy to solve a real world problem, and interpret the solution. Connect parabolic, exponential, and logarithmic functions with key elements of their graphs. MyMathLab Access Code inc. Ebook, ISBN 9780321199911. 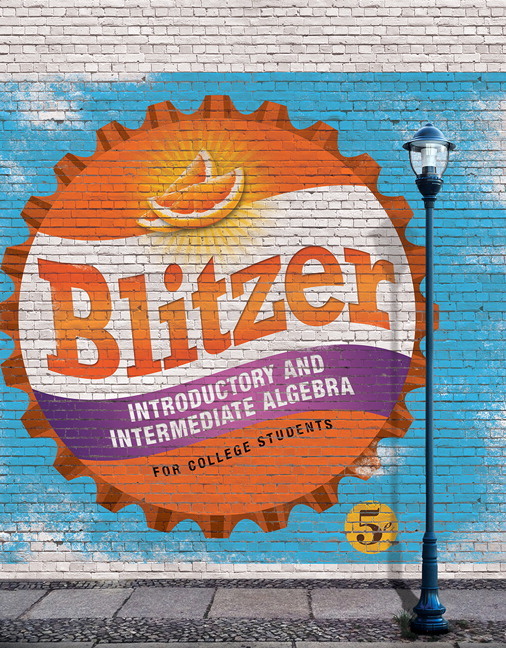 Introductory and intermediate Algebra for College Students (5th edition) by Robert Blitzer, ISBN 9780134178141. IF HAVE AN OLDER EDITION OF THE TEXTBOOK OR WHO HAVE THE ON-CAMPUS TEXT: An older edition of the textbook is fine to use to study from as the chapter structure rarely changes from edition to edition (and may save you money). If you already have the textbook used in the on-campus Math 090/095 class then you may use it to study from rather than the textbook listed above, but the sections may not match perfectly. Either way you are still required to have MyMathLab access since the tests are conducted there. OPTIONAL SUPPLEMENTAL E-BOOKS: GOLDen Mathematics: Elementary Algebra and GOLDen Mathematics: Intermediate Algebra by Sally Keely. Available from www.lulu.com/skeely downloadable by chapter/topic (for a small fee) or in their entireties as e-books ($15 each). See FAQs - GM ebooks for more information. Download/print Due Dates Chart [ Fall | Winter | Spring ] that lists all the weekly deadlines. The table below lists the specific sections in the e-textbook we are scheduled to cover each week. A detailed weekly class calendar is provided in your online classroom.